Carnival Cruise Lines started under Panamanian flag, with its Mardi Gras in 1972, and has remained largely loyal. While it did go into a mix of Panamanian and Liberian-flag ships, in more recent years the Bahamian flag has displaced that of Liberia. Even today, Carnival's most modern ships, 17 of them, fly the Panamanian flag, while half a dozen of its older ships use the Bahamian. The other Panamian-flag operator is MSC Cruises of Naples, a line that at one time did contemplate the Italian flag, but has not made the move so far, MSC is of course part of the Mediterranean Shipping Company of Geneva, one of the world's largest container lines, which keeps the majority of its fleet registered in Panama. Bermuda has offered an offshore registry for British-owned ships since 1974 and its flag is the British red ensign. For many years, this ensign carried the Bermuda coat of arms in the fly, as does the Bermudian flag today, but now the merchant flag that is used is the "undefaced UK Red Ensign." This meant that when P&O transferred its ships' registries from London to Hamilton, Bermuda, it did not even have to buy new flags for its ships! Today's Bermudian cruise ship fleet almost all comes from this one source, what was once P&O Princess Cruises but is now part of Carnival Corp & PLC. 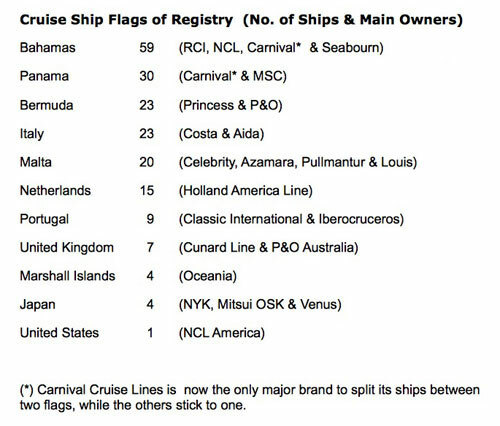 The Bermudian-flag fleet thus numbers 15 ships from Princess Cruises and seven from P&O, forming a flag where Carnival Corp & PLC now has more presence than that of Panama. Whilst a good part of this fleet was once registered in London, one of the interesting marketing gimmicks that the Bermudian flag allows is that P&O and Princess can now, unlike under the British flag, allow masters to perform marriages on board. While the Bermudian flag is British, its registry has different legislation. This is, of course, a new source of onboard revenue for P&O. The end result of this is that the German flag today retains only one important cruise ship, Peter Deilmann's Deutschland, with the balance of the German fleet being registered in the Bahamas (Hapag-Lloyd) or Malta (TUI Cruises). P&O Cruises Australia also keep the Pacific Sun registered in Malta. Not only that, but their Eurodam was named by Queen Beatrix in 2008 and Nieuw Amsterdam was named by Princess Maxima last year (With Queen Elizabeth II having christened the new Queen Elizabeth last year, Micky Arison seems to meet a lot of Queens these days) . Ironically, the three other UK-flag ships are the three ex-Sitmar ships that now form part of P&O Cruises Australia. So now we have P&O's UK-flag ships sailing from Australia while the UK is served by its Bermudian-flag ships! The fourth P&O Cruises Australia ship is flagged in Malta. The three Cunard ships and three P&O Australia ships nevertheless form another sphere of influence for Carnival Corp & PLC once again! It appears that the Greek flag too is about to disappear from cruise ships, with the only major operator still flying it, Louis Hellenic Cruises, applying to leave the flag because of huge pension costs now being demanded by local seamen's unions and potenitally an austerity-driven Greek government. None of the old Greek names are left, among them Chandris, Efthymiades, Epirotiki, Goulandris, Kavounides, Nomikos and Typaldos, all now long gone from the scene. Two and a half years ago, on September 6, 2008, The Cruise Examiner wrote in "A Return to Greek-flag Cruise Ships" about Louis Cruises placing eight of its ships under Greek flag. Then, on August 30, 2010, we wrote a news item headed "Greece Gives up Cruising Monopoly From its Ports." Now, only a few months later, we find that Louis is contemplating giving up the Greek flag in protest against these demands for onerous pension fund contributions and have applied to have the Louis Cristal and Louis Calypso moved to Malta, where a number of their other ships such as Louis Majesty are already registered. Louis Emerald may also follow. Meanwhile, Taylor's trial was completed on Friday and a verdict is now awaited. Most people forget that it was President George W Bush who was responsible for removing this dictator. Although Liberia is now led by Africa's first elected woman president and it retains a high number of cargo ships under its flag, it is very unlikely to be seen flying over cruise ships again, at least in the near future.